UPDATE: Game Frame is now available in the shop! In early 2015, despite demand, I stopped making the Game Frame “Kickstarter Edition” and started from scratch on a fresh design. I looked at my experience building the first 700 and rethought each component. I listened to my backers and incorporated their ideas. It took all year to finish but I’m extremely proud of the new design, inside and out, and I’m thrilled to finally share some details. 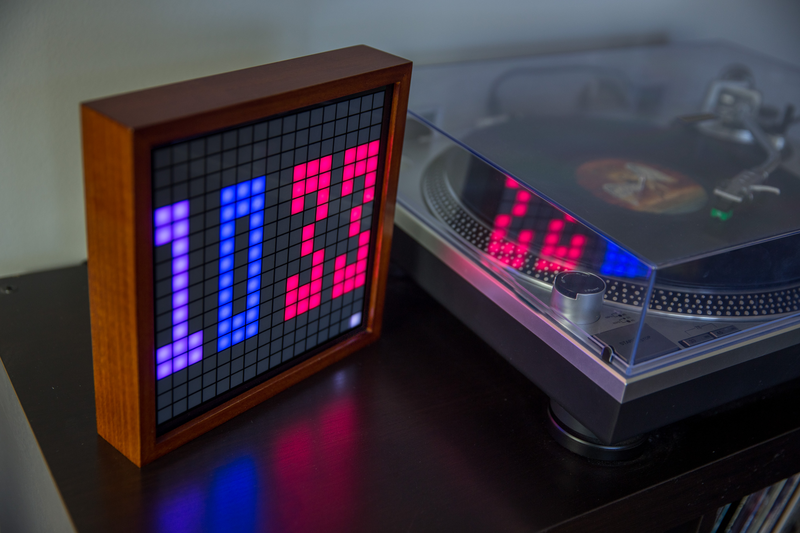 The new, solid wooden frame is perfectly square with no buttons or switches encumbering its profile. It’s available in a stained or natural finish. Both are equally beautiful and treated with a layer of clear coat prior to assembly. The display is now covered by glass with a black grid silk-screened directly to it, reducing alignment problems. 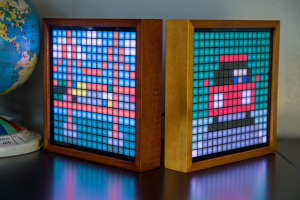 Behind the vellum screen is an injection molded mesh that creates perfectly square, isolated pixels. 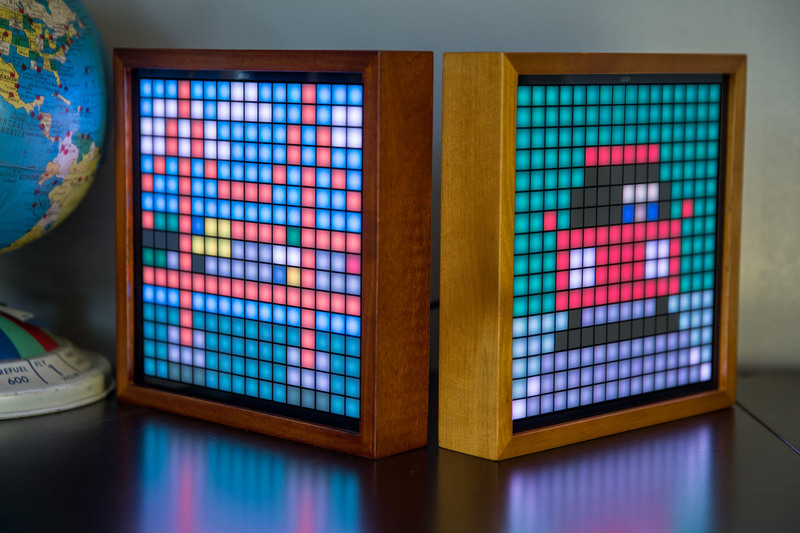 At the heart of the display is a custom LED board with pixels that are 1mm larger than the Kickstarter Edition, so the screen is now 16mm wider and taller. Meanwhile, the depth of the frame has been reduced by 6mm. With the new sleek frame, control of Game Frame has been offloaded to a small remote. As before, you only need two buttons to navigate the options. 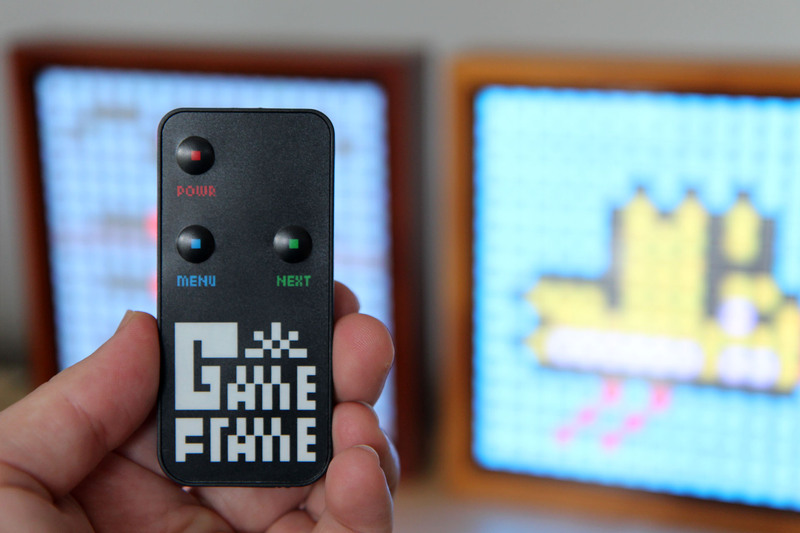 If it ever gets misplaced, Game Frame can learn signals from any other IR remote, or you can always use two trusty buttons on the rear. 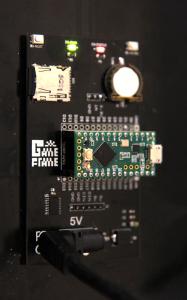 The processing brain of Game Frame has been upgraded from Arduino to Teensy LC, and this has numerous benefits. Most importantly it let me combine both Game & Clock features into a single firmware. The new processor also delivers a much higher frame rate (60 vs. 25 fps) and simple firmware updates via standard micro-USB cable. While I managed to stuff the Flash Memory to within 100 bytes of its capacity, tinkerers will have no trouble replacing the Teensy LC board with a Teensy 3.2 for additional power and resources. The source code compiles for both already, so you’re off to the races. 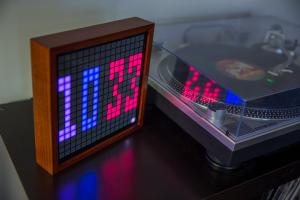 The Kickstarter Edition clock was based on a chip called the DS1307, which can lose track of time by a minute or more every week depending on your climate. The new Game Frame uses the DS3231, a temperature-compensated chip that is vastly superior. According to its specs, the worst-case scenario is less than a minute lost after an entire year. Plus, if you ever unplug your Game Frame, a battery now keeps track of the time. The new Game Frame includes 11 brand-new eBoy Animations and a slew of features like time-based Automatic Brightness Control (including turning the display off/on), force finish animations before progressing, and color correction/temperature adjustments. Game Frame will still be assembled in the USA, and I have a new partner in Portland, OR, who is streamlining fulfillment. It’s also fully backwards compatible with Kickstarter Edition animations. 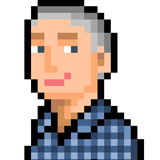 I’ve worked hard to bring you a great product and I look forward to getting one (or two!) in your hands. Got a new Game Frame 2.0 in the mail today. Nice redesign! Remote makes it much more enjoyable! Thank you!!! Would love to get a few of these… But they are just so expensive! Is there any deal for buying multiple boards? Feel free to contact me (jeremy at this domain) to discuss wholesale purchases.